OLPC Foundation has donated fifteen XO laptops to the University of the South Pacific (USP) as part of an historic new Memorandum of Understanding (MOU) committing the two partners to work together to further research and teacher training on 1-to-1 Computing in the Pacific. Speaking Saturday at an official handover of the laptops at a ceremony in Suva, Fiji, OLPC Oceania director, Michael Hutak, welcomed the new partnership as a breakthrough for OLPC in the region. "This is a great day for OLPC in the Pacific," said Mr Hutak. "USP is the leading teacher training institution in the region with campuses in all 10 Pacific countries where there are OLPC projects. Governments and ministries of education will now have access to the best minds in the region for their country to using the XO laptop in the classroom. And at the Japan Pacific ICT Centre, they will now have access to the best facilities too. House the laptops in a permanent lab at the new US$30 million Japan-Pacific ICT Centre at the Laucala Campus, Suva. Mr Hutak, who negotiated the agreement with USP Vice-Chancellor Rajesh Chandra in February, said the MOU "removes a crucial roadblock to broad and effective regional technical assistance to Pacific countries on OLPC. Since 2008, the Secretariat of the Pacific Community (SPC) has been an invaluable partner on technical deployment, assisting countries to kickstart OLPC projects. Now, with USP, we have the pre-eminent academic partner joining us, putting its significant expertise and resources behind this region-wide effort. But most importantly, this MOU signals an deeper commitment from all players in the region to addressing gaps on ICT in basic education. "This can only boost our collective efforts to bridge the digital divide -- an area where the Pacific is falling behind other regions." Mr Hutak also praised the vision and generosity of the Government of Japan, which has designed, built and funded the new state-of-the-art facilities at the Japan Pacific ICT Centre, and which has now officially handed the facility over to USP to take forward. 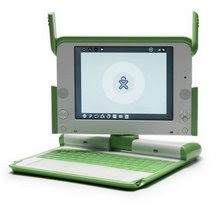 USP will make the OLPC lab at the centre available to trainee teachers at USP's School of Education. Leading research on educational impact and content development will be USP's Faculty of Science, Technology and Environment (FSTE). A working group to include the relevant USP Faculties, the ICT Centre, SPC, and OLPC will now be formed to take forward the effort. View more presentations from One Laptop per Pacific Child.